Participants electrify the South Zone BT Acumen finals in Bangalore with their cerebral energy. The quality of a debate is usually made up by the quality of debaters. But when you have topics like “Pursuit of Happiness Makes Managers Blind to Human Suffering” and “US Financial Crisis Signals the Death Knell of Capitalism” to attack and defend, the participants are bound to get tested as much for their oratory, intellect and knowledge as for their world views. Indeed, all the finer aspects of the art of debating were on display during the South Zone finals of the Business Today Acumen 2008 in Bangalore, where the best brains from some of India’s top Bschools, including hosts IIM Bangalore (IIM-B), IIM Kozikhode, Symbiosis Institute of Business Management (SIBM), ICFAI Business School, T.A. Pai Management Institute (TAPMI) and Anna University, engaged in a keen battle of minds over two days to earn a ticket to BT’s national business quiz and debate finals in Mumbai on November 29. The two-day event on November 7 and 8, co-sponsored by Aditya Birla Group and hosted by the incomparable Harsha Bhogle, proved to be a big hit with the audience comprising mostly students from the participating schools, who got a chance to win goodies like cellphones, webcams and MP3 players during the audience quiz on day 2. Judges for the event included A.K. Kishore, Assistant VP, Human Capitol; Shivraj, Head (Brand Strategy and Planning), Mudra Garments Lifestyle Retail; Kapil Aggarwal, VP, South Hyper Market; Mudit Shekhawat, Business Analyst, Yahoo! India; and K.R. Balasubramanyam, Assistant Editor, Business Today. Day 1 saw Anna University, IIM-B, ICFAI and IIM Kozikhode qualifying for the debate semi-finals and IIM Kozikhode, SIBM, ICFAI and TAPMI qualifying for the quiz finals. Day 2 began with the audience quiz where Bhogle kept the participants, audiences and judges on the edge of their seats. It was followed by the first debate semi-final between Anna University and ICFAI and the topic for them was “Pursuit of Happiness Makes Managers Blind to Human Suffering”. Speaking for the motion, Y. David Mathew of Anna University argued that “managers today are blind to employee wellbeing and can go to any lengths to meet targets and profits.” Renu Kansal of ICFAI contested this argument by citing examples of multinational firms like Google that rank #1 in employee satisfaction. But one of the judges took the contestants by surprise when he sought to know from them “whether Jet Airways was justified in sacking its employees to save the company or not”. 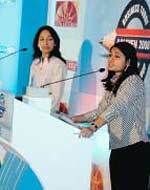 In the end, Harsimran Kaur and Renu Kansal of ICFAI made it to the debate finals. The second semi-final was a clash of titans: IIM-B vs IIM Kozikhode, who debated whether “Management Professionals Are the Most Over-hyped Professionals in the World”. Speaking for the motion, Mario Gonsalves (IIM-B) sought to make his point by asking, “If management professionals are so great then why don’t companies hire professors who have taught them the skill and expertise?” Gonsalves asserted that experience was a greater teacher than a top B-school. Megha Mookim of IIMKozikhode refuted this by saying: “Having dealt with case studies in a controlled and fully simulated environment, a management graduate is better equipped to handle boardroom challenges.” Because of the sheer quality of arguments by both sides, the judges had a tough time picking a winner. After much deliberation, they declared IIM-B as the second finalist. Before the boys of IIM-B took on the girls from ICFAI in the debate finals, it was time for the muchawaited quiz finals. The veterans from IIM Kozikhode made a great start and took early lead. SIBM seemed to be caught with wrong set of questions. After a session marked by much brainstorming, ICFAI finally won the ticket to the quiz finals in Mumbai. Finally, it was time for the debate finals. The topic, “US Financial Crisis Signals the Death Knell of Capitalism”, added to the quality of the debate and also made it more interesting. Speakers from IIM-B spoke in favour of government control and restraint over the financial and monetary systems while supporting the motion. Showing remarkable improvement from their semi-final round, the girls from ICFAI convinced everyone that capitalism was still the way forward. They had everything going for them until Judge Aggarwal posed this question: “What will you choose, a high paying job with a bank or a secure job with the Aditya Birla Group?” ICFAI’s Harsimran Kaur chose the Aditya Birla Group, but she could not convince the judge with her reasoning. That gave IIM-B the victory. This was the last of zonal finals, and all eyes are now riveted on the grand finale of BT Acumen in Mumbai. Watch this space.